Now that we are fully in the house and I have all of my lovely kitchen gadgets back ( Hello my lovely KitchenAid MixMaster, how I missed you so!) I am itching to put my new kitchen through its paces and bake up a storm. 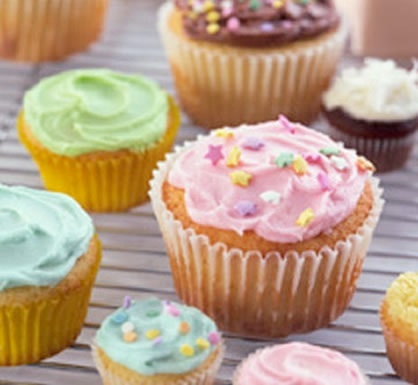 I am particularly dreaming about whipping up some wonderful cupcakes. Little darlings of bite size goodness. Yum. The only problem is what the heck would I do with them all? You can’t really make just a few cupcakes, part of the pleasure of making them is the assembly line process. Sweet little soldiers lined up on the counter ready to be frosted and sprinkled. . . Maybe I can bake a batch or two and send them with the hubby to the office. (Of course keeping a few back for a tasty after dinner treat.) Sounds like a plan, I let you know how they turn out.